Cinclus schulzi Cabanis, 1883, Cerro Bayo, Tucuman, Argentina. English: Rufous-throated dipper; French: Cincle a gorge rousse; German: Rostkehl-Wassermasel; Spanish: Mirlo de Agua Gorjirufo. 5.6-6 in (14-15 cm); weight, no data. Plumage uniformly gray-brown above and below, with contrasting orange-brown throat and upper chest. Inner webs of primaries partially white, giving a white flash on open wing. 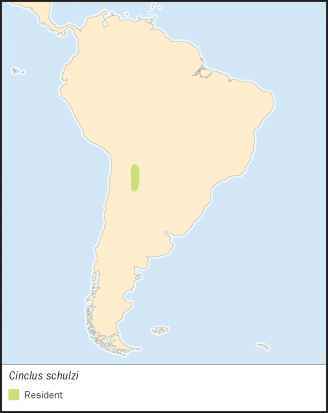 Very restricted range in northern Argentina (Salta, Jujuy, Cata-marca, and Tucuman) and extreme southern Bolivia (Tarija). Swift-flowing mountain streams, apparently mostly in areas where the dominant forest-type is alder (4,600-8,200 ft; 1,400-2,500 m). Sometimes grouped with Cinclus leucocephalus. Generally similar to other dipper species; however, apparently it does not dive into rushing water or swim as frequently as the others. The bowing and dipping behavior also seems to be absent, replaced by a wing-flicking which displays the white flash on the primary feathers. 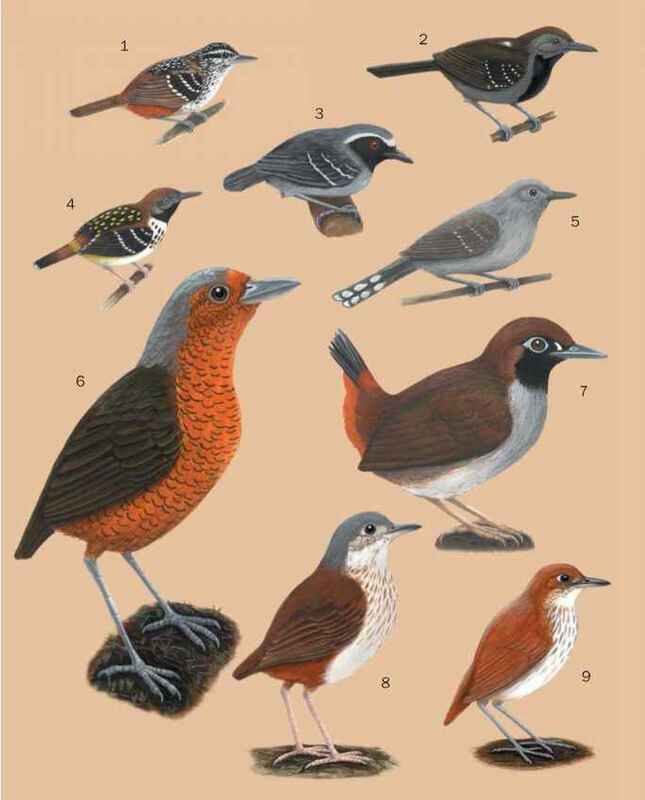 Song is similar to that of white-capped dipper, but more thrush-like; call a sharp "zeet-zeet." Little data; aquatic invertebrates including beetles. Only a few nests have been described. Nest is typical globular dipper structure with side entrance, the outer part moss, with an inner bowl of grasses, etc., located in rock crevices or under bridges. Eggs two, unmarked glossy white. Incubation and fledging periods unknown; young fed by both parents. Classified as Vulnerable. Total range is in an area about 60 by 375 mi (100 by 600 km), but within this area not all suitable habitat is occupied. Susceptible to stream quality degradation; only a small part of its total range is protected.